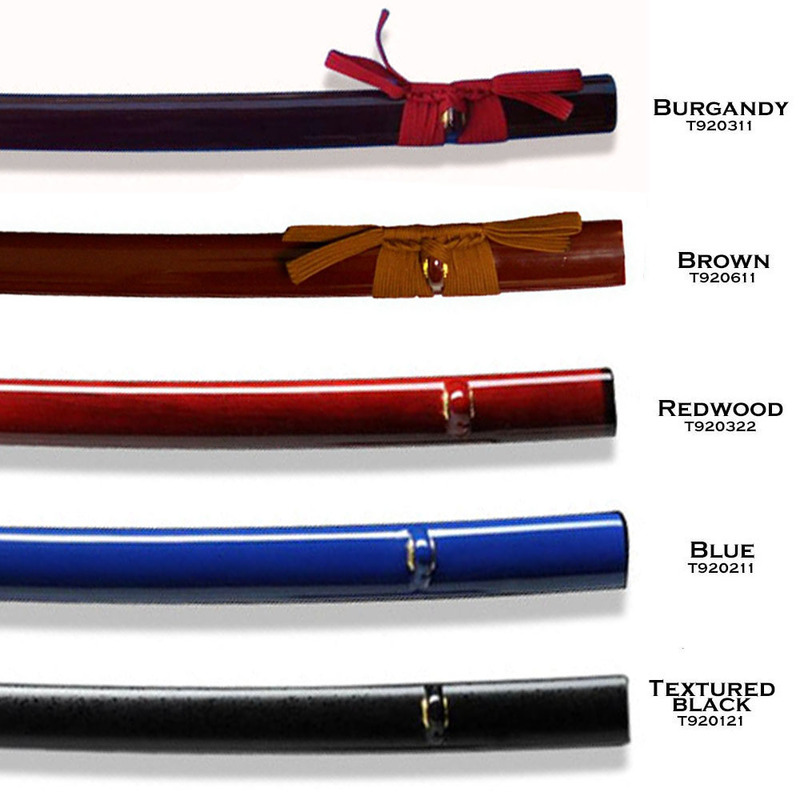 Iron Musashi or Bamboo Tsuba with your choice of solid bodied blade or bo-hi (blood groove), 5 different ito wrap colors and 5 different saya options. Assembled and shipped within 1 week! 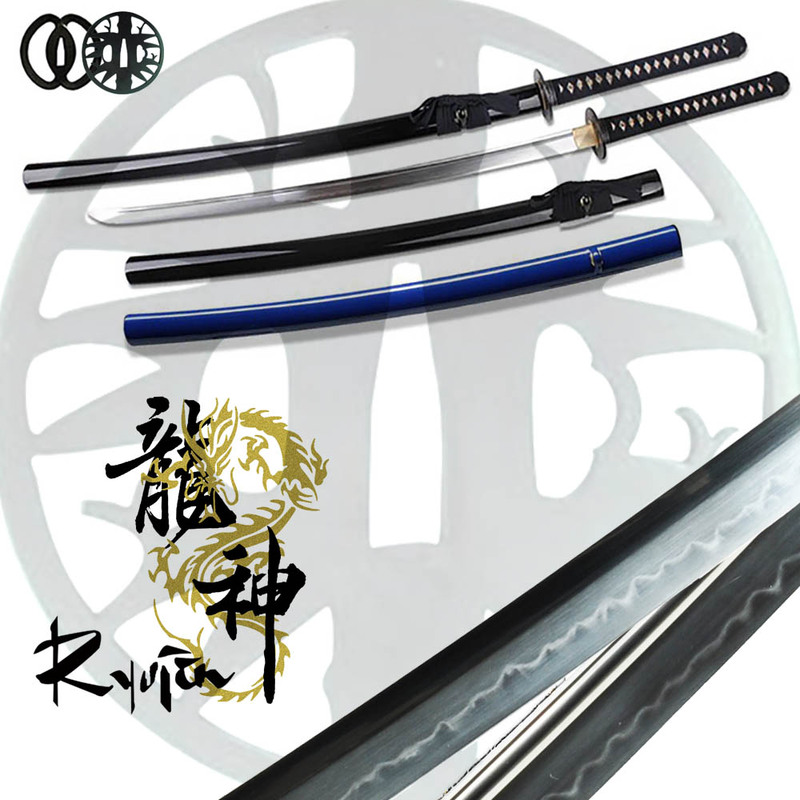 Affordable, traditional and with some cool custom options - the entry level Ryujin T10 Katana - Musashi Tsuba Custom Option Lite Mk II takes a high quality T10 tool steel blade with real hamon and lets YOU choose whether or not you want it with bo-hi (for a faster sword) or no-hi (for a more powerful cutter) and then lets you select from 5 tsuka (handle) and 5 saya (sheathe) combinations to make it uniquely your own. And the best part, it is all assembled for you at the Ryujin workshop based in Los Angeles within 7 days of ordering! 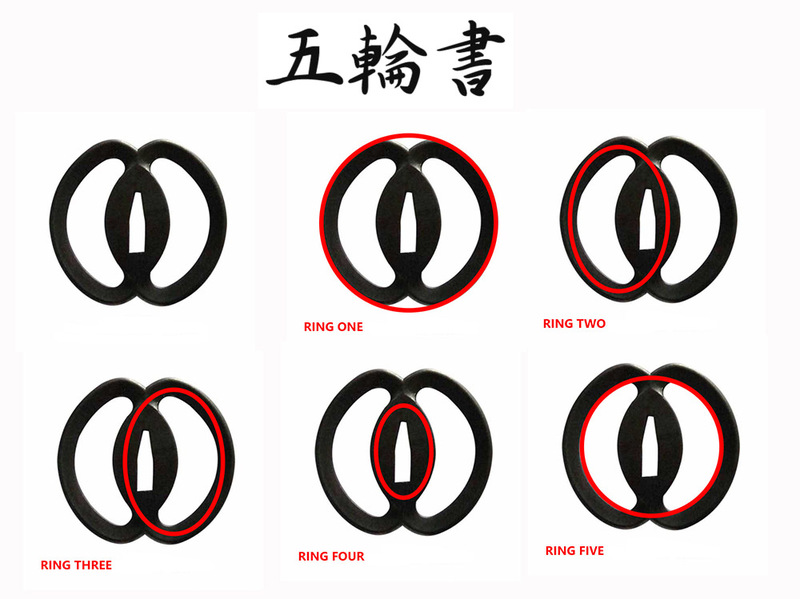 The original concept was developed by Mr. Sam Sung, one of the co-founders of Musashi Swords and with the modular assembly system he has developed, keeping a large variety of parts in stock and YOU select what design best suits your unique style WITHOUT breaking the bank..! The ONLY difference between this sword and the others in this series is this one has slightly less customization options and comes with an iron, Musashi tsuba. That and the price of course, being $30 less than the full custom option. Don't make the mistake of thinking these swords are just pretty ornaments - these are serious, practical blades that are surprisingly robust yet traditionally constructed and at our special introductory price, are some of the best cutting swords available anywhere near this price point. The ability to customize them is indeed just a very special free bonus!! To know exactly what to expect, and to get a little more than you would otherwise, we strongly recommend you read the review of this particular sword on SBG.. If you read it later - you may miss out on something..
Whatever you do, do not pass this one by. Miyamoto Musashi was arguably Japans most famous and skilled swordsman, having fought his first duel to the death at age 13 against a much older and experienced Samurai who was challenging all comers. According to historical records, Musashi threw the bigger man to the ground and beat him to death with a wooden stick! By end of his life, having retired to a cave at age 60 to write his famous treatise on strategy "Go Rin No Sho" (A book of five rings) he had fought at least 60 duels (though more likely double this number), several major battles and remained undefeated, earning him the title 'Kensai' (Sword Saint). An eccentric character who defied social norms and lived his own way, without a master and upsetting the establishment who tried on many occasions to kill him without success, he was also a talented painter, writer and designed the tsuba you see on this particular sword, which depending on how you count them, has 5 'rings' and, like everything his life represented, is eminently practical - the iron construction being as strong as any other tsuba, bt lighter, subtly shifting the blades balance away from the handle to give it additional cutting power, which is further enhanced with the solid bodied/no-hi blade. 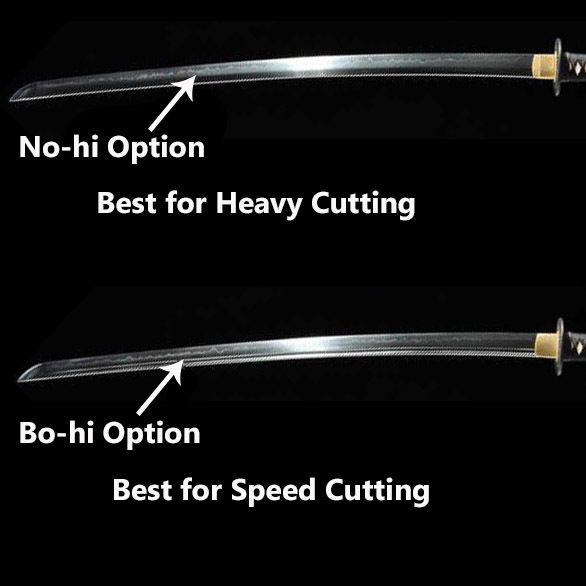 Suitable for frequent backyard or dojo cutting. 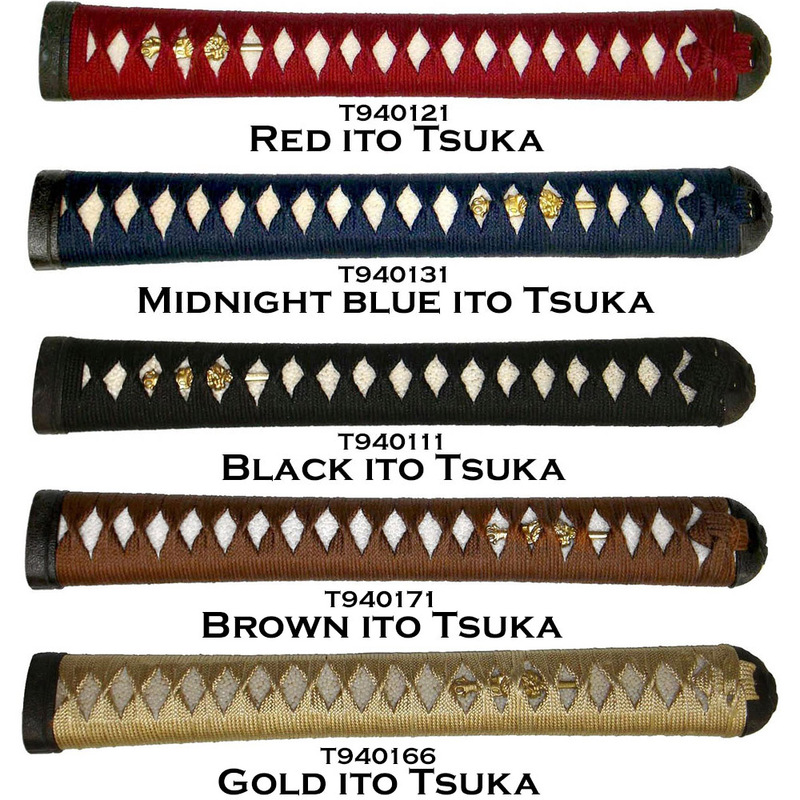 Traditional blade - select bo-hi/no-hi and your own tsuka and saya option. 27.5" blade with 11" handle. Weight 2.3lbs (with bo-hi) 2.5lbs (no-hi version). Differentially hardened fully sharpened T10 Tool Steel blade with real hamon. 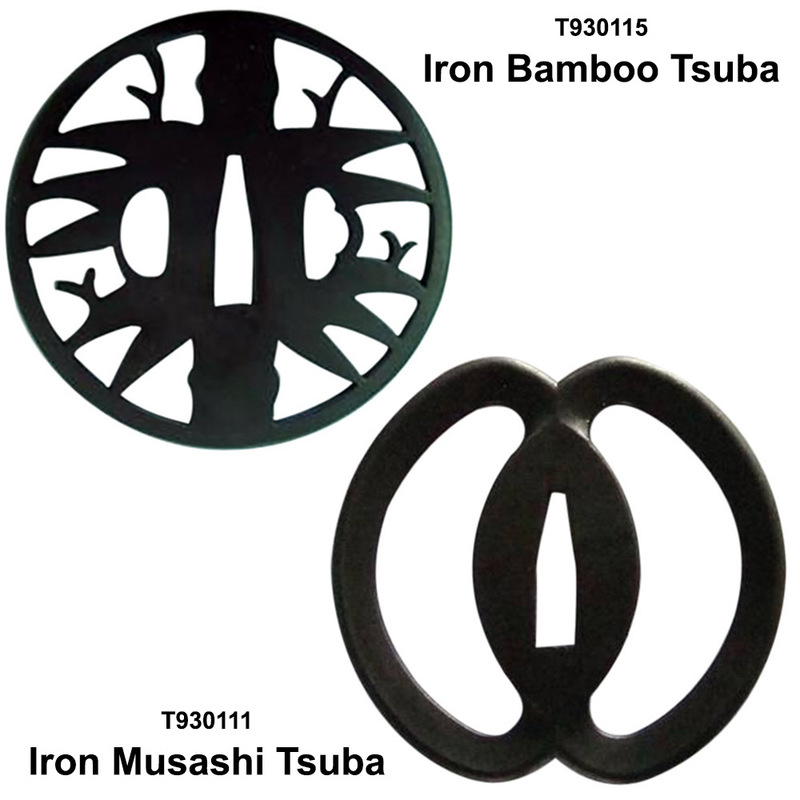 Solid iron fittings with iron Musashi or Bamboo tsuba. Colored Rayon wrapped ito over authentic rayskin in 5 different styles. Wooden lacquered saya in your choice of 5 colors and styles. Display Box Not Included. This is my fourth sword from SBG, the first two were Ronin Pro monosteel with no Hamon. The fit and finish were ok, but as they were meant to be high use beaters, the fittings were not as important. These are tough blades, but I live in Hawaii where corrosion and stains are a constant threat. I have used these blades on bamboo, banana trees, mango trees, etc.,. The acid from these plants will damage the finish. But these blades cut nicely while holding their edge. This sword is my second T10, and like the first one, the Shadow Tiger, it has superior fit and finish compared to the Ronin Pros. These two swords are too beautiful to just cut anything. These are reserved for mats, bamboo, and other woods. The cutting action is smooth as like hitting a baseball pure. Keep up the good work of finding affordable sources of such powerful swords.